iPhone Repair - Cracked Screen - Quest Wireless on Warnall Rd. Does your iPhone need to be fixed? Are you having trouble with a cracked screen or will your phone simply not turn on? 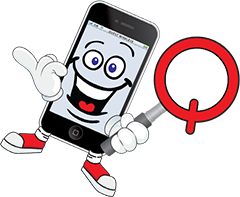 Call on the experienced iPhone technicians at Quest Wireless Sales and Repair in Kansas City to solve your iPhone problems. All of our technicians are level 3 certified and are qualified to handle any problems you may be having with your iPhone. No matter what iPhone you carry, our technicians at Quest Wireless Sales and Repair are trained to diagnose, repair, or replace your iPhone. Need your iPhone repaired now? Bring your phone to our Kansas City store conveniently located in the Waldo area at 7224 Wornall Road, Kansas City, MO or give us a call (816) 444- 1088 and we will get your phone fixed fast. iPhone 6 LCD Cracked Screen Repair! iPhone 6 Plus LCD Cracked Screen Repair! iPhone 5, iPhone 5S & iPhone 5C LCD Cracked Screen Repair!